Producing live corporate events is hard work. But getting cameras into these events and then distributing the video they capture online on a real-time basis is an even greater challenge. Not all corporate presenters are suited for the rigors of live video, and pumping out live video to the web can produce its own share of technical headaches. Unfortunately, many corporate video professionals have no choice but to step to the plate and address the live video production challenge. At least when it comes to webcasting, the ability to leverage streaming to expand the reach of an executive presentation or training session generates the type of business value that encourages organizations to keep pumping more and more budget into their video production efforts. Leverage technologies that allow you to identify who is watching your live presentation. For an internal event, many systems can track viewers based on identifying information in the corporate directory. For external webcasts, collect registration information as “price of admission” to attend event. Working with your subject matter expert presenters, who in some instances might be willing to provide pre-event polling questions, you can utilize polling tools and ask questions related to the topic—and have the presenter take the data and incorporate the results in the actual webcast. Don’t allow your presenters to “wing it.” Particularly in situations where large audiences are expected to attend a live event, executives are advised to participate in at least one dry run of the session using the technology they will be leveraging during the presentation itself. 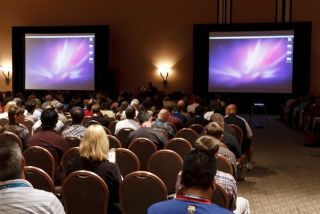 The preparation sessions can help address technical snafus before they emerge to embarrass presenters in high-profile events. Live events, by their nature, are unpredictable. Unexpected attendance levels can degrade the quality of the experience for all users if proper infrastructure is not in place. Arm your organization with sufficient in-house networking capabilities or be ready to leverage outside hosted services to address spikes in live event viewership. Where possible, weave PowerPoint presentations and other on-screen graphics into your live-event presentation. Engaging slides will distract viewers from the talking-head video of a presenting executive, increasing the “watchability” of the overall presentation. At the same time, make sure your presenters don’t go too far and start relying on PowerPoint slides with text-heavy graphics that detract from the experience. Viewers of online business video content have short attention spans. Where practical, ping-pong between several presenters at regular intervals. Viewers will stay more engaged if a new face and voice appears every five minutes. Many technology platforms make it possible to present pre-produced video clips – even as part of live events. Typically, these clips can carry higher production values than would be possible in a live presentation. The approach provides the best of both worlds, coupling the spontaneity of live presentations with the packaging of pre-produced content. Most live presentations should set aside time to address questions from the audience. This ensures you are tapping into topics and themes relevant to your viewers. But be sure to prepare questions ahead of the event that can be asked of presenters—just in case viewers do not submit any questions when first asked to do so. Even in large Webcasts reaching hundreds of viewers at a time, video platforms make it possible to collect information from the audience and use it to enhance the immediacy of the presentation. Integrating survey questions into the presentation, for instance, is one way to enhance engagement. By asking viewers a question and then reporting aggregate results, presenters can emphasize the live nature of the presentation and present audience insight on the fly. No matter how engaging and well-promoted your live event is, not all would-be viewers will be able to clear their schedule to attend the presentation as it happens. Be sure to have technology platforms that allow you to capture your live event for later replay on an on-demand basis. This will expand the audience for your event and magnify the communications impact of your video production. Use viewership tracking tools after the event is over to find clues regarding who tuned into the message and whether the presentation met your team’s communications objectives. Use the tracking data to identify relevant targets for follow-up messaging. For external Webcasts, for instance, place a priority on contacting individuals who watched an entire live event. Their extended attention signals higher-than-average interest in your organization’s products and services. Steve Vonder Haar is a regular contributor to AV Technology and a senior analyst with Wainhouse Research. He can be reached at svonder@wainhouse.com.